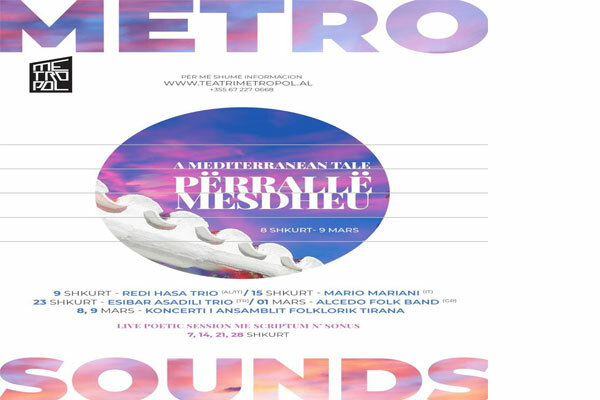 A Mediterranean Tale- this is the Metro Sound Festival organized by Tirana cultural Center “Metropol Theater”. Famous musicians from Italy, Turkey, Greece and Albanian who have built their career abroad will gather at Metropol Theater to offer live music concerts. The "Metro Sounds" program consists of an artistic selection that shows Mediterranean identity and affiliation. For this reason, besides the main name, the festival will also have the "Mediterranean tale". As such, this program brings culture pieces from our closest neighbors as a form of appreciation and dialogue with the cultures that connect us through music. Part of this festival will be also the Poetic evnings called "Sriptum n'Sonus". During this musical festival will accompany the sounds and projections of the Scriptum N 'Sonus poetry evenings that will bring us the selection of some of the best poets and authors of the Mediterranean.